Let’s explore Xilinx Zynq SDR with a gentle introduction. Programmable hardware software defined radio is now within reach at a reasonable cost and modest effort. During recent years, most of us have experimented with single board computers like Arduino and Raspberry Pi. These contain a highly integrated computing system. 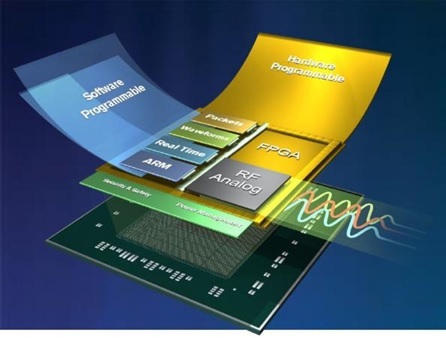 In the wireless world, manufacturers have taken integration further and produced complete radio systems on chips (SoC). Odds are good that your mobile phone, wireless router, Bluetooth device and GPS receiver all use SoC. My first experience with wireless SoC was the ESP8266 and NodeMCU development board. The ESP device contains a powerful Arduino-like microcontroller and a complete WiFi system. In the future, hobbyists can build and implement complete software defined radio leveraging SoC and development boards. Soon, we will provide an example with the STEMLab Red Pitaya. But first, let’s explore the future that has already arrived with the Xilinx Zynq SDR SoC. You could argue that the ideal architecture for a software defined radio might be a single chip that contains a computer, FPGA and analog-digital conversion. Guess what? This ideal has arrived in the Zynq. At the high end, Xilinx Zync Ultrascale+ contains a complete RF signal chain including 8 channel MIMO 12 or 14 bit conversion a Gigahertz speeds. But these devices are really, really expensive. For us mere mortals, the low-cost Zynq 7000 SoC series just contains an ARM Cortex CPU and a powerful FPGA. You can buy these devices in the $100 range. Then, you can mate them with ADC or RF transceiver chips to accomplish SDR at a very reasonable cost. This is where we will focus our attention because it paves the way for Red Pitaya, coming up next. Homebrew ham radio can now be achieved by programming both software and hardware. No more analog components or soldering irons. Xilinx Zynq SDR, combined with analog-digital conversion, lets you program analog, digital, interconnect and IO circuits using your computer. These SoC are amazing, with fast communication between programmable logic and computer blocks – up to 100 GB/s bandwidth. You can download or create and install proven DSP functions, thousands of them. And, here’s the neat thing. You can reprogram your hardware on the fly. Since the Zynq runs embedded real time operating system – usually Linux – you can save your FPGA code in the file system as bit streams which can be loaded immediately. Your tools to accomplish these things include Intellectual Property from Xilinx or other open sources for the programmable hardware FPGA. You can prototype and test Xilinx Synq SDR using Matlab and Simulink. You can build you radio code using GNURadio either embedded or on your PC. There is so much more. But my purpose in this article is simply to expose the ideas and get people started thinking about SDR using programmable hardware at a reasonable cost. If you want more, check out the Zynq e-book which is a great source of entry-to-intermediate level learning.